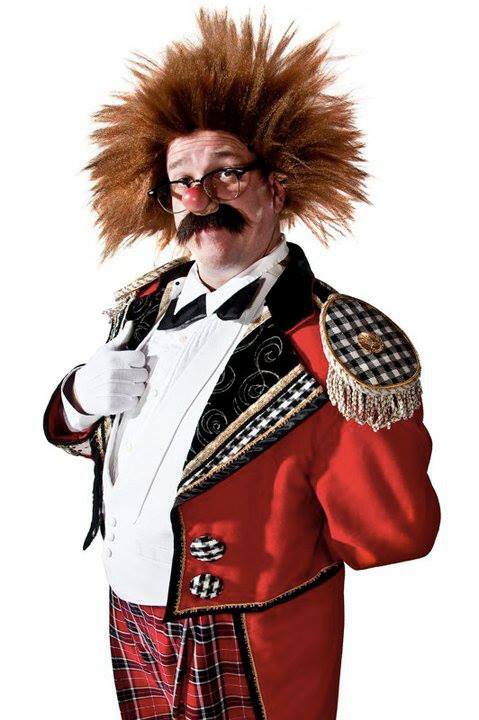 In the next week or so I'll be auctioning off some props, costumes, shoes and a trunk on eBay to help finance a very large Felix Adler Awards related expense here at clownalley.net and to get my garage and office back into some kind of reasonable shape. Those of you not interested in the auction items but who would still consider chipping in a few bucks towards covering such an expense, please contact me privately at cashincomedy@yahoo.com. Another great scan from Bill! Bill has provided us with such great stuff over the years. 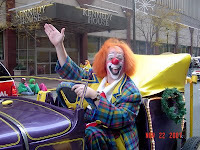 If you appreciate his contributions to clownalley.net please take a moment to visit his wonderful circus blog and peruse all the treasures that can be found at his online store. 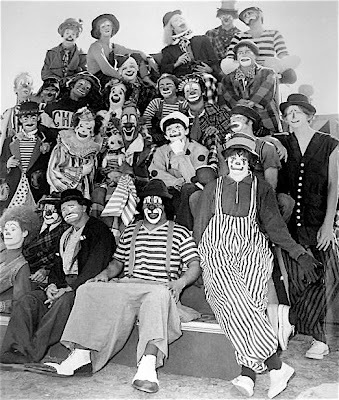 The 101st edition Red Unit Clown Alley of the Ringling Bros. and Barnum & Bailey Circus featuring such luminaries as Peggy Williams, Jim Howle, Billy Baker, Frosty Little, Mike Padilla, Keith Crary, Billy Ward, Danny Chapman, Zapata as well as Master Clowns Bobby Kay and Lou Jacobs. Can anyone out there fill in the names of some of the others? 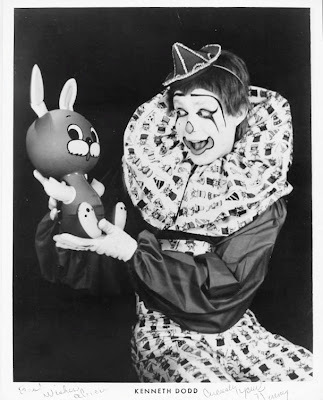 Longtime circus pro and early Clown College instructor, Chuck Sateja. 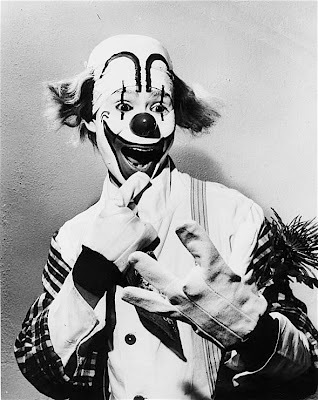 Peluza without his usual headpiece and looking a lot less like Jimmy Stewart in The Greatest Show on Earth; looking a lot more like a smaller TV market Bozo the Clown. 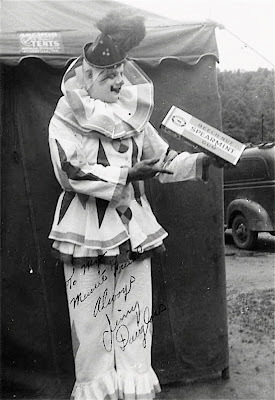 A clever man whose clowning career spanned most of the 20th century, Prof. Paul Wenzel. 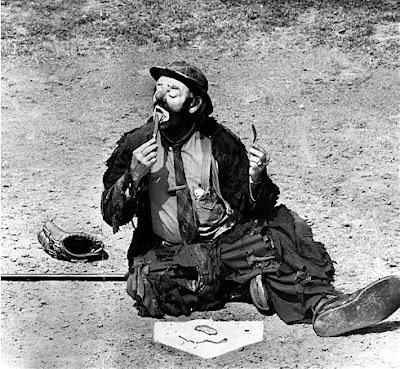 Emmett Kelly during his brief stint as the mascot for the Brooklyn Dodgers. It would have been a great gig if the team hadn't announced in October of '57 that after 68 seasons in Brooklyn, the Dodgers would be moving to Los Angeles and would no longer be "Dem Bums". 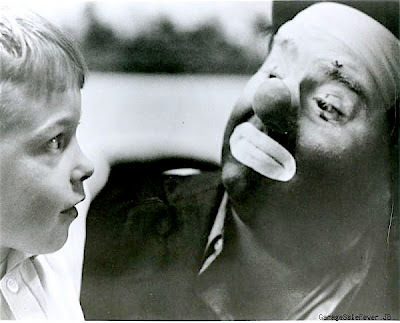 Longtime Shrine and Beatty-Cole Producing Clown, Jimmy Douglas. 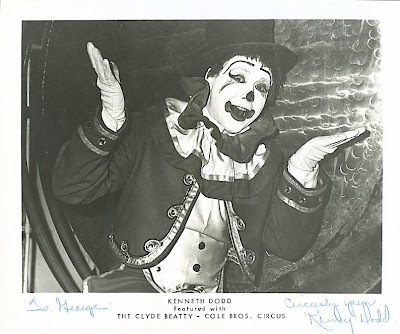 Another publicity photo of Kenny Dodd from his long stint on the Beatty-Cole show. 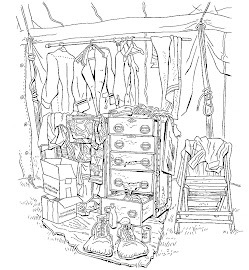 Former acrobat, wire-walker and tumbler, Al Ackerman on the Polack Bros. 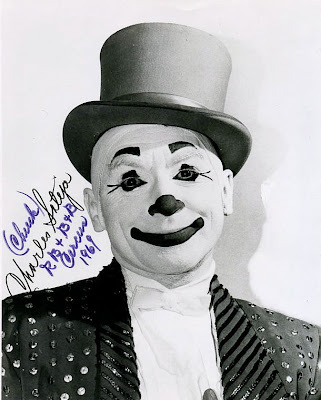 Circus in 1961 where he was billed as "America's Oldest Clown" at the age of 71. I have to admit, I didn't get the whole Jigalov thing. Folks love him, folks rave about him, but the video that I'd seen just never did it for me. I get it now. This guy is brilliant! And who is this playing the white role? He's really fantastic! I've seen video of Jigalov with a few partners since the loss of Eduard Alexeenko but this guy is my favorite. He's absolutely first-rate. F.O.C. 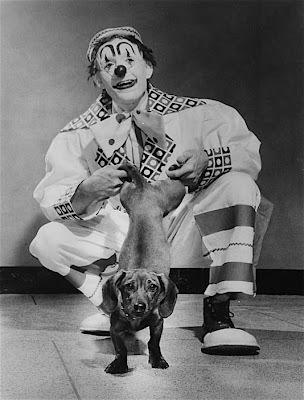 Dean "Elmo Gibb" Chambers and his comedy dog act, "Elmo Gibb and the Fido Five". FELIX ADLER: "No, as a matter of fact I DON'T ever get tired of posting photos of Felix." A 1960s-era photo of Beatty-Cole alley fixture, Kenny Dodd. 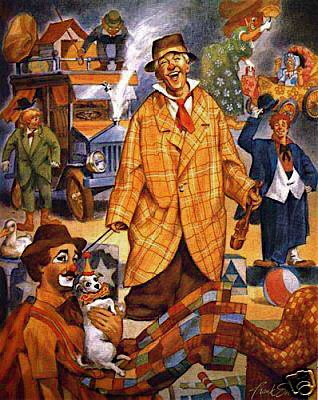 Perennial clownalley.net favorite, Mr. Hal Haviland. 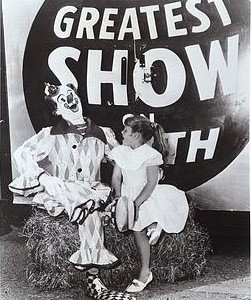 Javier Esparza Peluza with Miss Loni in an undated publicity photo from an unidentified Shrine circus. Marceline Orbes from the program of the NY Hippodrome's 1910 production of "A Trip to Japan". 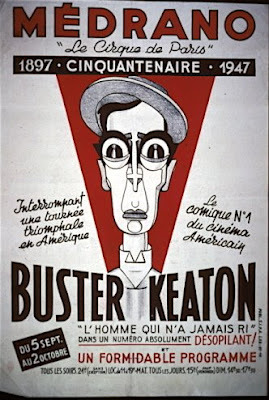 A poster for one of Buster Keaton's appearances clowning at the Cirque Medrano. 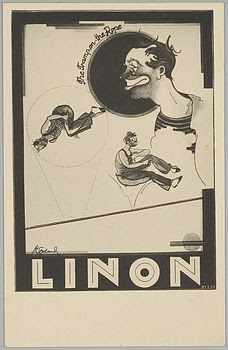 A poster for Belgian wire clown, Linon. 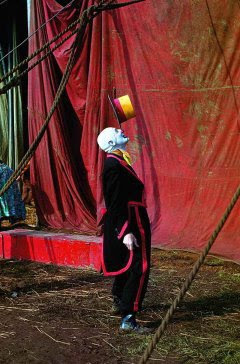 A photo of Lou Nagy balancing a top hat (watch out there, Kris Kremo!) 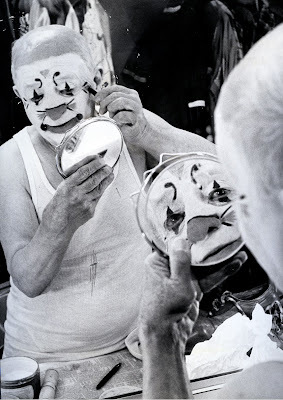 from the new Taschen book on the American circus. 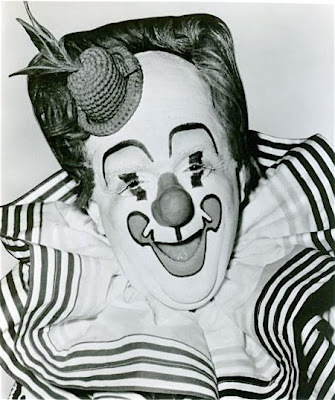 For those who asked for a better look at the well designed and very appealing makeup of Mr. Burnes. 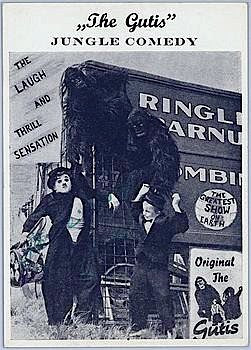 One of life's truely great pleasures, Circus Oz. 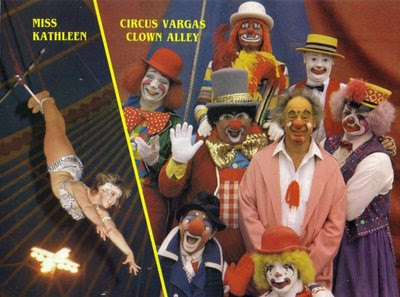 Tell me again how circus doesn't work on a procenium stage? CHARLIE RIVEL AND LOU JACOBS ON THE SAME BILL?!? Charlie Rivel and Lou Jacobs (and Don Saunders) on the same bill at an international festival in September of 1972??? Someone out there must know SOMETHING about this one! 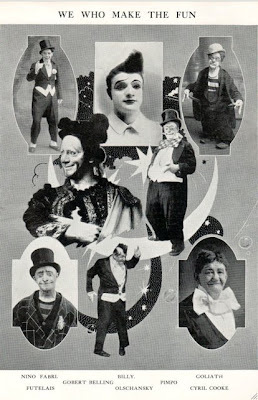 One of the greatest slaptick knockabout comedy acts in history, The Gutis. Looks like Scott Parker there in the straw hat. Is that one of the Fornasaris in the center? 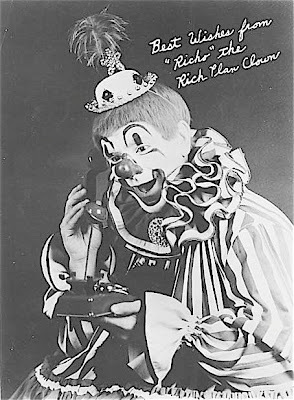 Does anyone out there know how to get in touch with Clown College grad and ex-Ringling clown, Christopher Bricker? I had a wonderful conversation with F.O.C. (Friend of Clownalley.net) Mr. Jackie LeClaire last night. 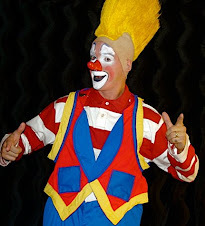 Jackie is well and doing fine in Sarasota, FL and continues to clown with Dolly Jacobs and Pedro Reiss' Circus Sarasota and it's outreach programs. 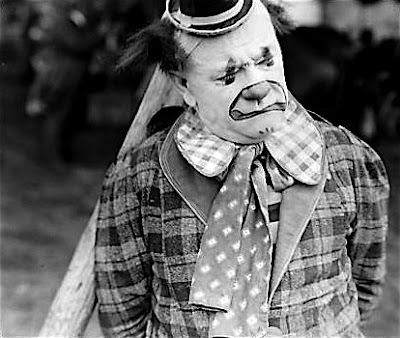 He sometimes gets frustrated with his memory, that some or other clown's name from yesteryear isn't right on the tip of his tongue, but we were talking about people that he might have worked with a just a few times maybe 40 or 50 years ago! I'd say his memory is doing just fine! This photo of me was taken in 1957. 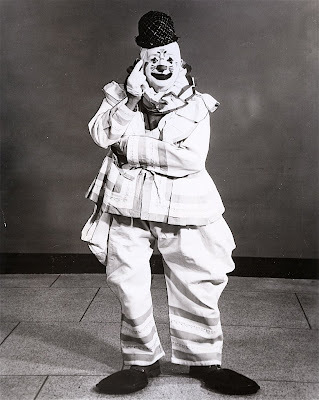 It was as "Richo" the Rich Plan Clown. It was taken in Roanoke, Va. by a dept store photographer that was doing photos of children for Christmas. The picture was distributed by the company and I had some black and white 8 x 10 's made up for my own use. I worked two and a half years in PR work for them. About the best job I ever had salary and conditions wise. 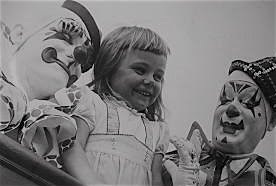 It unfortunately all went bust in 1959 as so many of the dealers of the frozen food plan wanted me and they could not spread me around. It was beginning to cause a negative, so they said I could either leave now with two weeks pay or work the two weeks. I took the leave now option. I had saved what was for me, more money than I had ever had. They had paid all my motels, provided me with a car and gave me every 6th week off with salary and expenses. I just went to New York, took the Song Of Norway ship and went to Europe on a personal tour for 6 months, making 17 countries. I have never regretted that. I was only 32 at the time. 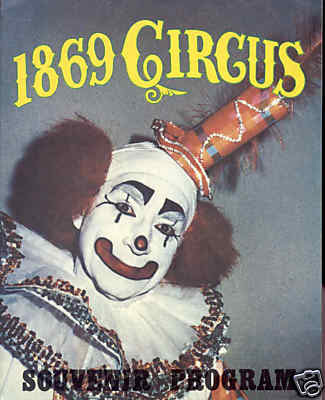 Saw so many circuses there, never realizing that I would be touring Europe with a Ringling Bros. unit in 63 and 64. I still have a few of these old photos, plus the 8 x 10 's with the "Richo" the Rich Plan Clown signature already printed on them. Brings back a lot of memories. 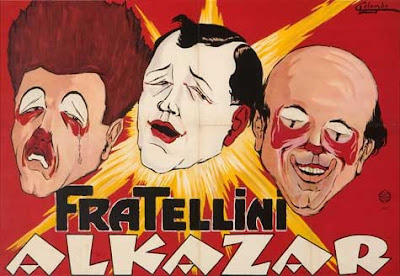 Here's a poster for the Fratellinis featuring neither Francios, Paul nor Albert. Is this an earlier Fratellini trio? The poster looks too dated to me to be from the post-Albert period. 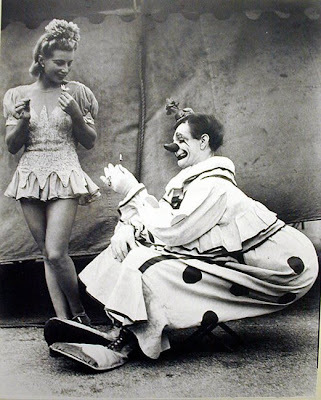 F.O.C., Mr. Chuck Burnes in a Ringling publicity picture from the late 50s/early 60s. 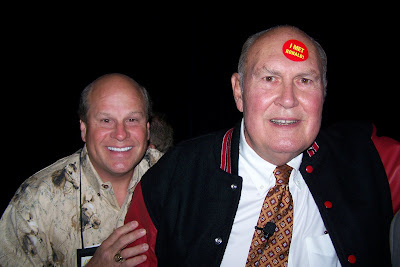 Just a note to say "hi" and spread the joy of me meeting one of my all time clown heroes… Mr. Willard Scott! I was in Chicago a couple of weeks ago for a conference and he made a surprise appearance. He is just as pleasant, funny and enlightening in person as he is on TV. "I Met Ronald”... that's me! Ronald Yarborough! I tried to get clean copies of this segment as well as "10 Clowns" from the folks at Sesame Workshop WHO WERE JUST ABOUT AS RUDE AS COULD POSSIBLY BE! 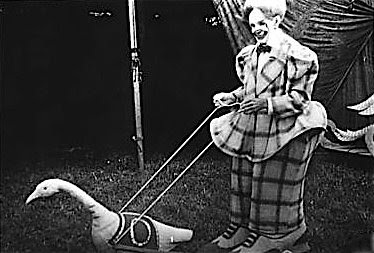 I explained that we were hoping to get copies of the two segments for the Clown College reunion and that these segments were some of the ONLY available footage of some of these performers. "Oh, I'm sure it's on Google, go get it from there. OK?... click." The Sesame Workshop PR department could certainly use a lesson or two in courtesy, manners and c-o-o-p-e-r-a-t-i-o-n. So today's posts are brought to you by the letters "F" and "U" and by the number "2". HAPPY 68TH BIRTHDAY, BUGS BUNNY! The first "true" appearance of Bugs Bunny and Elmer Fudd. Elmer is a dimwitted hunter, "wooking for wabbits." Bugs is clever, smooth-talking character, who confuses Elmer with double-talk and misdirection. Elmer is no match for the wascally wabbit, even when he thinks Bugs is dead. Last Sunday we featured Frank's interpretation of some whitefaces, today we see Frank's salute to the augustes. 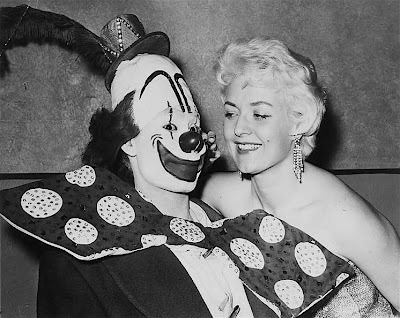 Chester Sherman and Baby Kae in a publicity shot for a Shrine date, most likely the Polock Show, circa 1950s. 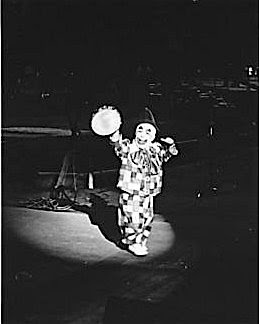 PRINCE PAUL ALPERT: Ringling, 1960s. 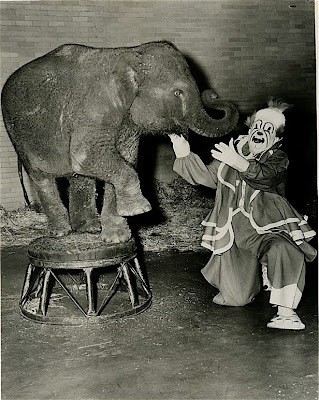 WHAT DOES THE AMERICAN CIRCUS NEED? I said it before, dinosaurs. It would be even better if they jumped motorcycles over stuff, flew in jet packs and battled 40 foot steampunk elephants.